PROJECT UPDATE FOR WIS 116 RECONSTRUCTION: TRAFFIC WILL RETURN TO NORMAL WIS 116 PATTERN ON WEDNESDAY, OCT. 31. Welcome to the construction website for the WIS 116 (Main St.) reconstruction and Wolf River Bridge replacement in downtown Winneconne, Wisconsin. Project details, scope, schedule, traffic impacts, detour routes, construction photos, and temporary business signing and information for businesses/property owners in the work zone can be found on this project website. Work continues in 2018 on the Wolf River Bridge replacement project. Local traffic across the Wolf River Bridge will be maintained at all times during construction, with the new bridge open for vehicle use by fall of 2018. WIS 116 (Main Street) urban reconstruction begins in March/April this year. WIS 116 will be closed and detoured in stages. Local access along WIS 116 from the east end of the village to 13th Avenue will be maintained so that local traffic can access the local street system. Trucks may also use this route. Business owners can place temporary signing during construction to direct traffic on alternate streets to their business. WisDOT requires a free permit (see below) for business signing. WIS 116 (Main St.) from just west of 9th St. to just east of 13th Ave., in Winneconne, Winnebago County. Existing bridge over the Wolf River in downtown Winneconne to be replaced with a fixed span bridge just south of the existing alignment. Bridge construction will take place in five stages, with local traffic across the bridge being maintained at all times. Reconstruction of the bridge approaches to extend roughly to 2nd St. on the west and to 2nd Ave. on the east. New fishing platforms to be constructed roughly in the same location as the existing roadway bridge extending from both shores with a gap over the main navigation channel. 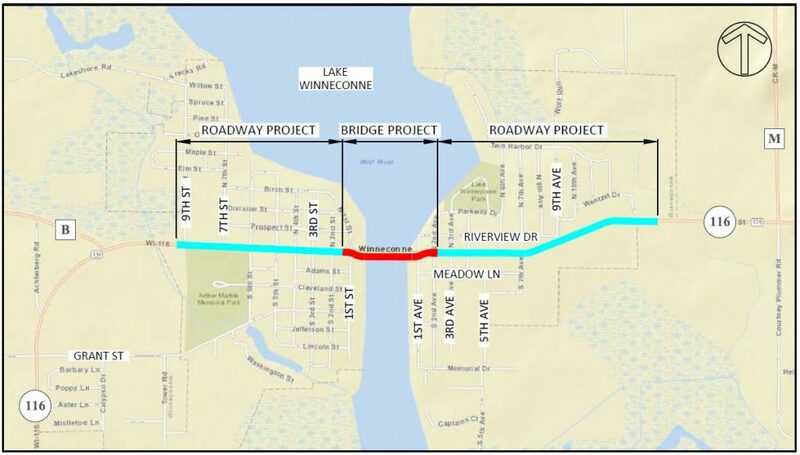 Remainder of Main St. within the village of Winneconne (2nd St. to 9th St. on the west and 2nd Ave. to 13th Ave. on the east) to be reconstructed as part of a separate project. New storm sewer and utilities under the existing roadway will be replaced. Bridge replacement construction began September 11, 2017 and continues in 2018. New bridge opens for traffic in fall of 2018. Temporary Business Sign permits are available as a fillable-form WORD download (above) or you can request one from construction project manager Bill Bertrand by calling (920) 360-3124 or email William.bertrand@dot.wi.gov. Please email the completed permit as an attachment to Bill, or if you prefer to mail the completed form, please address to: Bill Bertrand, WisDOT NE Region, 944 Vanderperren Way, Green Bay, WI 54304. If you have any questions or concerns regarding the bridge replacement or Main Street improvement project, please contact any of the WisDOT employees below.